Here are details of our dept research seminar series for the 2017-18 academic year. There are lots of great speakers and wonderful topics. We’re really looking forward to them! All seminars (*aside from 29 Sept) are held on Tuesdays in Amory 105, 2.00-3.30pm (1.30pm for drinks). I completed my PhD in Theology & Religion at Exeter University in April 2016. My research focused on the impact of trauma on theological discourse. When I reflect back on my time at Exeter I wish I hadn’t been in such a rush to finish my research! I found the department to be such a friendly and collegiate place. I really enjoyed getting to know all the various members of staff and students and I know my time there prepared me very well for life after the PhD. The opportunities I had for sharing and developing my research alongside the teaching I did whilst studying was so helpful in broadening my experience beyond just the PhD. Before I finished my doctoral studies, I had already been appointed as a Research Fellow at Durham University. I took up this appointment less than a month after my viva! My role here at Durham is based in CODEC which is a research centre for digital theology. I’ve spent the last year researching whether you can (or should!) 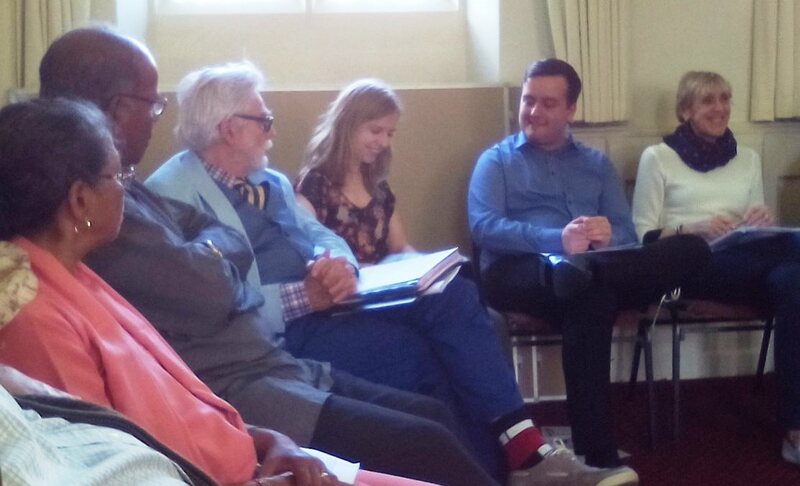 train to be a vicar (mostly) online. I think the answer is yes but that it requires some shifts in our theological thinking about digital spaces. I’ve been researching the nature of our corporeality in digital spaces in order to challenge the idea that when we go ‘online’ we become disembodied. This research will be published as a journal article later this year. Earlier this year I signed a contract with SCM Press to publish a version of my doctoral thesis as a monograph, so I’ll be spending the upcoming summer editing that and getting it ready for publication. This post has given me opportunity to present my research internationally and to meet fascinating people doing really interesting work from around the world. Whilst it is primarily a research position, I have also had the opportunity to teach here at Durham and in various other contexts. In the coming months I’m excited about developing my work in digital theology more deeply. My research is moving into considering sacramentality in digital spaces—a really juicy topic! I know my time at Exeter prepared me so well for the joys and the difficulties of academic life—I can’t think of a better place to have taken my first steps into this world. In a rather odd move, I went from my PhD in theology to working at the Materials Department at Oxford University. In a slightly confusing job, I work for the materials department where I consult for the Templeton World Charity Foundation. It has been a job full of cool opportunities: conferences around the world, meeting and helping fabulous researchers who are doing cutting edge work in science and religion, and being able to promote interesting lines of theological scholarship, including the “Practical Theodicy” project being run by Prof. Christopher Southgate. The job has non-stop travel (since January, I’ve been to Canada, the Bahamas, New Zealand, New York, Athens, and more locally Edinburgh and Canterbury) and sometimes the travel has been through unusual means. I never knew I would learn to co-pilot a single engine plane, for example. I also started tutoring for the faculty of Theology and Religion about a year and a half ago, so life has been a nice mix of scholarship, travel, and teaching. However, it is now time to move on, and in September I will take up at two year research position in Theology here in Oxford, as one of the 12 globally-placed St Andrews Fellows in Science and Religion. I will be trying to develop a “compassionate theodicy”—attempting to reorient the purpose of theodicy away from the dispassionate intellectual exercise that now exists, which is a set of arguments lobbed between Christian philosophers and their sceptical atheist or agnostic counterparts, and see if theodicy can be moved towards something that could help Christian believers who are struggling with faith in times of suffering. Reflecting back on my time in Exeter, I continue to be amazed by the quality of my supervision. It was an extremely warm and caring environment, and I never felt “lost” in the system. Rather, there was a sense of rich collegiality between the faculty and the students, aided by events like regular morning trips for coffee. My supervisor, Chris Southgate, was fabulously generous with his time and even rewrote two courses that we taught together, just so that they would incorporate my interests (“More Bible! More history!”). The PhD was hard work—desperately difficult at times—but Exeter was a great place to do it. Looking back, there is no other programme in the world I would have gone for instead. I have never written a book before, and did not know what to expect, and did not know whether a publisher would be interested in my dissertation on Paul Tillich and Judaism, which carried the title Dialectic of the Holy: Paul Tillich’s Idea of Judaism within the History of Religion. One thing that worked in my favor is that I gave a short paper on one of the core arguments from my dissertation at a small Tillich conference in Oxford in July of 2014, the day before I graduated from Exeter. My paper was selected to be in the conference proceedings, to be published by DeGruyter (my book came out before the conference proceedings!). So I was on the “radar screen” of DeGruyter. I submitted a book proposal in January of 2015, and received a contract within about 30 days, and was asked to submit revisions by September of 2015. They were flexible in extending that deadline by about 30 days, and the substantive form of the manuscript was completed by year end 2015. It got quiet for a while after that, and by the spring of 2016 I was reading galley proofs, and after about four rounds of proofreading, I gave permission to print the final copy in July of 2016. The book was published in September of 2016, about one month later than the estimate in the original contract. I had to construct my own index, and I’m glad I put the time into that. My book is very “conceptual,” so there was a lot of cross-referring back and forth between some terms. The most difficult part of the proofreading was converting the UK format on the use of single and double quotes to the U.S. format – ugh! But it all worked out nicely in the end. I thought DeGruyter was great, and I am very pleased to have published with them. Since 2013 I have been involved with an incredible archaeological project just outside of the Old City walls of Jerusalem. 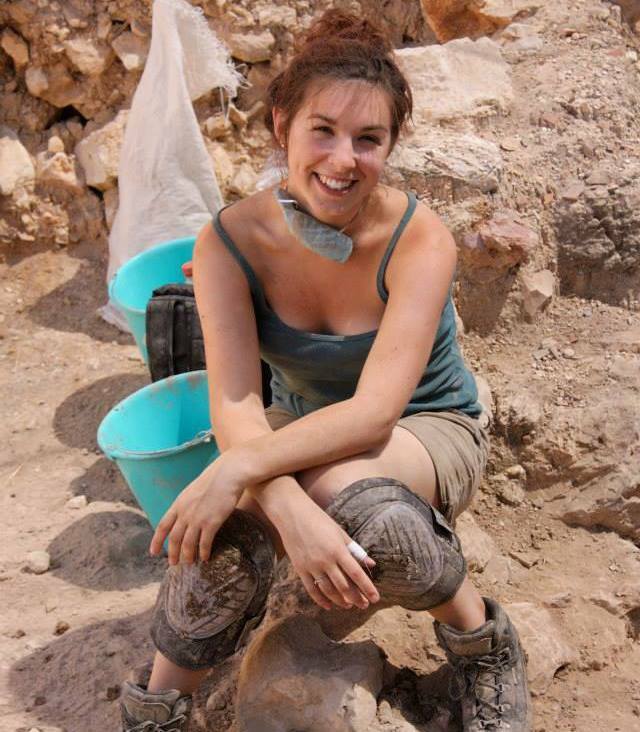 I found out about the dig during my MA Jewish Studies at KCL where I was being taught a module on the Bible and Archaeology by Prof. Joan Taylor. Joan had previously worked with Dr Shimon Gibson on other projects and he, as the dig director, was launching a new expedition on Mount Zion, Jerusalem. That summer I spent two weeks digging out a dark, wet, first century CE cistern and found the first complete vessel, a cooking pot, of the dig season. 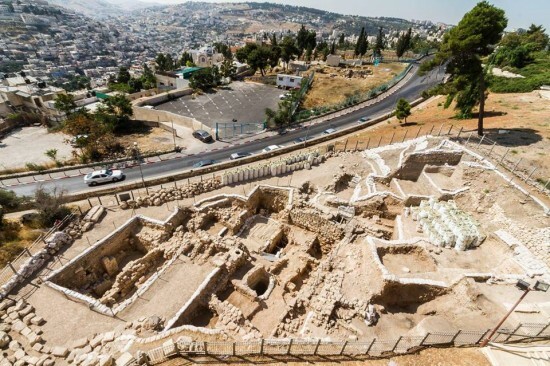 It may have been brought down there when people fled from the Romans during the destruction of Jerusalem and cooked underground whilst in hiding. I think that was the moment I fell in love with archaeology. Nobody else had seen or touched this item for thousands of years until I found it. The site is located on the slope outside the Old City walls but was within the ancient walls during the Roman period. In the Byzantine period the site would have been at the southern end of the Cardo Maximus as can be seen on the Madaba map. In the Early Islamic period Mount Zion was used for domestic houses, but the Crusaders and Ayyubids built fortifications across the mount including a gate tower, the remains of which are in this excavation. The site is just outside of the Zion Gate and is a continuation of excavations that commenced in the 1970s by Magen Broshi. In previous seasons the remains of a wealthy first century domestic building containing a mikveh, three ovens, a cistern and a bathtub were found. In the deepest area that has been excavated a large mosaic and partially constructed archway was found from the Byzantine period. The following year I was invited back to the team as a staff member, an Assistant to an Area Supervisor working on a different area of the site. It was disappointing that I could not return to my previous area, as it had become too deep to work in safely but it was thrilling to have been noticed and given a staff position. The 2014 season was very different to my first experience. Firstly as staff I had to stay for the all four weeks of the dig season and secondly, I did not find anything near as exciting as the complete cooking vessel. But that’s archaeology for you. In 2015 and 2016 I returned as Assistant to a new Area Supervisor. However, in 2016 I was given for the first time my own little area which I was completely in charge of. Some may say it was beginners luck, but my team uncovered an ostracon, a pearl and a murex shell amongst other finds that really brought back that thrill I experienced in my first season in the muddy cistern. We also hosted a community day where families came and dug with us one weekend, the child of the site director, Dr Rafi Lewis, found our first gold coin and it has Nero’s head on it. Our metal detecting guys were not happy! More information about the coin can be found here: http://www.biblicalarchaeology.org/daily/ancient-cultures/daily-life-and-practice/gold-nero-coin-jerusalem/. I felt privileged to be asked to present my research twice in association with this project. In 2015 I gave a presentation to all the dig volunteers and staff on archaeology and Israelite sacrifice. It was the first time I’d presented my research that wasn’t just to other postgraduates, instead it was a mixture of professional archaeologists and non-academic volunteers. It was a great experience though and everyone was really interested in what I had said. The following year I was invited to speak on the University of the Holy Land’s Graduate Research Seminar Series in association with the Albright Institute. It was to take place at Hebrew University and I presented on the use of food and alcohol in Israelite Household Religion. The questions I received afterwards were challenging but greatly appreciated and many people came up to me afterwards and told me how interesting and informative they found it. This summer I am returning to Mount Zion as an Area Supervisor. It will be a lot of responsibility; accurately recording every dig square, find, wall, baulk and drawing maps is imperative for future scholars to be able to use this data in the future. Shimon Gibson has also mentioned that he wants me to be involved with the publication of reports particularly related to the animal bones that have been found on the site because of my research on food and sacrifice. This year will be my preparation for a future dig that Dr Gibson hopes to launch in 2019 in the Armenian Gardens within the Old City walls. I hope that I will be able to be involved with his excavations in the future, being a part of the Mount Zion team has been an amazing experience both in terms of the friends I have made over the years and the opportunities it has opened up for me academically. Going on that first dig in 2013 was probably the best decision of my life. On Saturday 6th May, the 22nd Joint Postgraduate Conference on Theology and Religion was held at Exeter for the first time. With a total of 30 research papers presented, the day proved to be a fascinating exploration of the current research undertaken by MA and PhD students in the South West. The presentations were split in to themes covering all things from ‘Belief and Practice in Antiquity’ to ‘Philosophy, Ethics and Revelation’. This is just some indication of the great diversity of papers explored during the day. The eclectic nature of this conference inspired a feeling of open-mindedness amongst the guests and speakers. This relaxed atmosphere, and the words of encouragement from my fellow postgraduate students, somewhat eased my nerves of presenting a paper for the first time later in the day. I was curious to learn more about the areas of theology that some speakers had chosen to dedicate three years of their lives to, and yet had never crossed my path of study. I have found throughout my education that many students (including myself at times!) have a ‘but will this be in the exam?’ approach to learning, unwilling to clutter their minds with information that will not increase their final percentage. 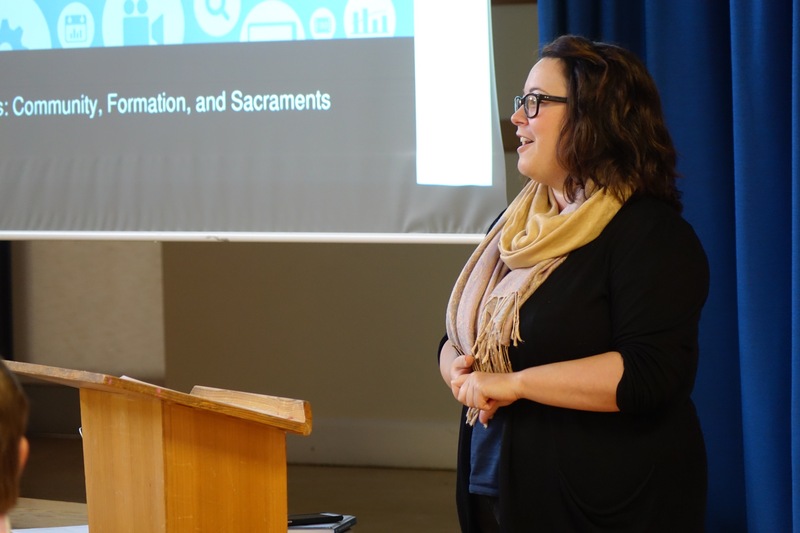 It was refreshing to be involved in a day where the audience were enthusiastic to widen their view of theology and engage in these new areas of study that are, no doubt, often outside their own chosen sub-discipline. Following the coffee break, it was time for me to give my first presentation at an academic conference, with a paper entitled ‘Judas Superstar? A reflection on the relationship between Jesus and Judas in Jesus Christ Superstar’. Despite my apprehension as a fresh-faced MA student addressing an audience who, generally, had much more experience of academic conferences, I was relieved that the questions were less intimidating than I had feared! As far as academic papers go, I have found this one particularly enjoyable to present as the inclusion of movie clips and rock-ballads naturally accompany my analysis and the sight of audience heads bobbing along to Judas’ solos made me feel more at ease throughout the presentation. It seems the perfect way to have introduced myself to this academic rite of passage. One paper I found particularly thought- provoking was by Amna Nazir, a PhD student of Law and Theology with cross-institutional supervision from Birmingham City University and the University of Birmingham. She demonstrated the necessity of interdisciplinary study in her paper, ‘The Death Penalty in Islam: A Religious Necessity?’. Having never studied Islam, this is a topic I knew very little about but I was intrigued by the provocative title. Nazir explored the death penalty in Sharia law and international law and argued that, until there is absolute justice in the courts and governments of these countries, the death penalty cannot be right. Nazir explained that court cases’ reports are often restricted and so it is impossible to know whether countries have properly adhered to both Sharia and international laws. Furthermore, the great variance of its practice across Islamic countries is indicative of the fact there is a lack of consensus even within the faith about when the death penalty is to be evoked. I found the paper incredibly interesting to listen to and the discussion that followed was just as rich. It became clear that there are a small number of Muslim voices supporting this view and, where westerners attempt to enforce their views against it, their criticism is merely met with distain or suspicion by Islamic countries. Ultimately, if the application of the death penalty in Islam is to change in any way, the impetus must come from within the religion. 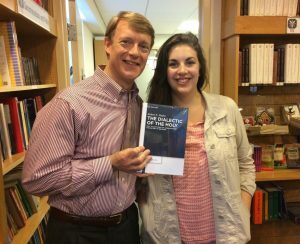 It was exciting for me to be involved with such a packed day of research papers and, in my view, the conference aptly demonstrated the active interest present in the theology’s many manifestations. The post-graduate community highlighted their willingness to engage in interdisciplinary study and to recognise the impact religious studies can have in a modern context. And in truth it’s a conference that defies tidy definition, with eclecticism of methodology and content very much the modus operandi. It’s a small event (all the attendees sit together in large circle) yet one with a deep well of tradition (spanning some forty years). It’s a conference thematically inspired by a single scholar’s work (the late Edward Bailey) yet one that in just a couple of days intersects with sociology, theology, psychology, gender theory, memory studies, and knitting. So what binds it all together? My own tentative answer is two-fold. First, there is a recurring ambition to tease out what’s happening at the awkward edges of various phenomena we describe as ‘religious’ or ‘secular’. When is devotion to a practice or an idea to be understood as ‘religious’, and when is it not? What are the power-dynamics and contextual factors at play when we label something ‘religion’? But the second element is a commitment to an unusual mode of conference organisation, specifically one in which participants are asked to circulate 5-8,000 word papers well in advance, and an expectation that, in person, each presenter then offer merely a few prompts for discussion. This is, in other words, a conference in which preparation and intellectual generosity are key. It’s also one where, at its best, formal hierarchy is put to one side, with input coming from final year undergraduates through to emeritus fellows. And most of the time it works. In what ways do fan cultures ritualise their devotion, and re-imagine their identities? How do women grieve, memorialise, and provide comfort through traditions of textile production? What is it to ‘feel’ the Christmas spirit? Why are so many people ticking ‘Christian’ on censuses while rarely turning up in churches? And (for my own paper) how is state-led Holocaust remembrance borrowing and reconfiguring manifestations of sacrality? These are just a few of the topics that came into view in what was a packed programme of less than 48 hours. The emphasis is on working things through together, exploring unexpected connections, taking a few risks. The bumpy usually-productive/occasionally-frustrating outcome sits at the far side of the spectrum to the conferences of dress-codes and niche panels. And at the end of it all I find myself, on the one hand, wary of saying we’ve further nailed down the exact parameters of religion vs. non-religion, yet on the other, no less convinced that there have been and will continue to be so many modes in which to experience the world. If every conference was like Implicit Religion maybe I’d eventually feel like I was building with jelly. But without intellectual spaces like this the risk is of remaining hubristically oblivious to the brittle fragility of our categories. As tourists look at the view from Mtatsminda (Holy Mountain) north across Tbilisi they are struck first and foremost by the enormous scale of the new Sameba (Trinity) Cathedral straight ahead of them; a little higher still is the Cathedral of the Iverian Virgin Mary rising from Makhata hill and the casual viewer would be correct in interpreting this as a sign of the immense influence the Georgian Orthodox Church wields in today’s Georgia. If however you turn to the left and look northwest, there is something a little odd on the horizon. On a low hill stands a black shape looking uncannily like Stonehenge and glowering forbiddingly even on the sunniest of days. 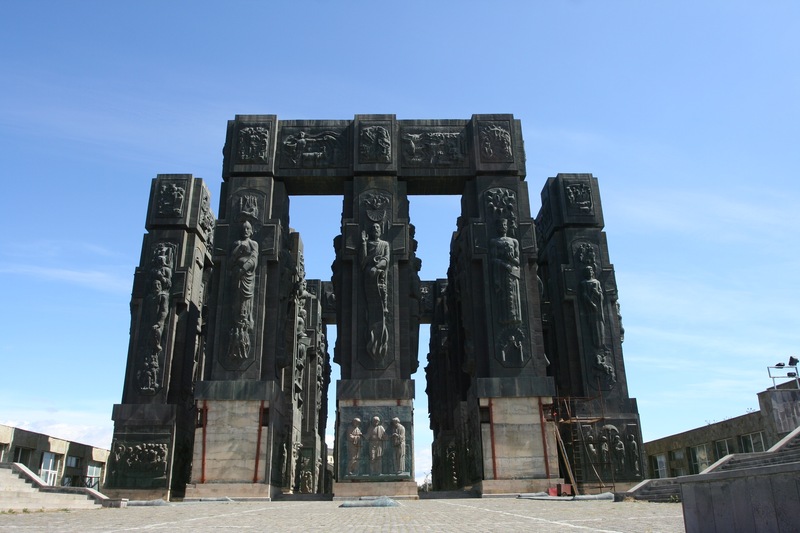 If you didn’t know any better you might be forgiven for thinking that Tbilisi has a megalithic monument to beat all others, but then the sheer size of the structure and its hulking darkness may cause the curious to wonder just what exactly it is that they are looking at? The answer is The Chronicle of Georgia, a grandiose vanity project begun in 1985 in what would turn out to be the dying years of the Soviet Union by the celebrated Soviet modernist sculptor Zurab Tsereteli, President of the Russian Academy of Arts. Strangely this vast monument is mentioned in no guide book to modern Tbilisi and very few locals even know it is there, let alone admitting to visiting the place. The Tbilisi Museum of Modern Art is a private institution owned by Tsereteli and its permanent collection consists only of his works and a large collection of photographs of the sculptor with the world’s wealthiest and most influential people. However none of these pictures nor the many coffee table books on show make reference to The Chronicle….So what on earth is it? What is going on? Given the dearth of information on the project, apart from establishing that it began with Soviet state funding in 1985, all that follows has been gleaned from conversation with a local architect and first-hand observations based on a visit to the site. In the dying days of the Soviet Union those favoured by the Party were exceptionally powerful and, if you had the right connections, it was easy for celebrated cultural figures to raise funding for vanity projects – which is what Tbilisi society says was the case with Tsereteli and his Chronicle. However the timing proved to be off; only six years later the Soviet Union collapsed and the mysterious buildings around the complex remained unfinished. More seriously perhaps, several bronze panels were stolen and, at the time of writing, look unlikely ever to be replaced. When we look at the timing of the monument things are seriously weird because six years before the end of Communism Tsereteli built a hymn of praise to Christianity and, specifically, a Georgian Christian past on a hill outside the capital. The bottom quarter of each of the hulking monoliths depicted a scene from the life of Christ (it is a number of these panels that have now been stolen) and above each of these Christian scenes a hero (or heroine – but mainly heroes) of Georgian history is depicted in a cruciform cartouche in a manner that deliberately equates the life of Christ with the struggles of the Georgian nation. This goes against the iconographical conventions of Christian Art, where Christ is normally placed in the most exalted position and often shown larger than the figures around him; he is certainly not placed at ground level a quarter of the size of the human figures above him. 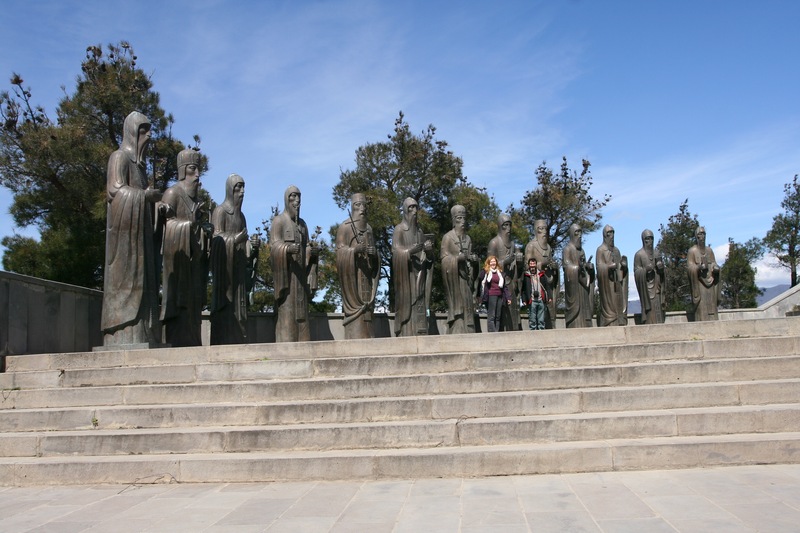 In case the viewer misses the significance of the visual imagery on a terrace to the left as the visitor approaches the monument are thirteen double life-sized figures representing the Thirteen Syrian or Assyrian Fathers who are purported to have brought monasticism to sixth century Georgia. They stand gazing out over the monument and the eerie ambience of the place is… well, to be honest you really do feel that you are in an episode of Game of Thrones and gaze around for the dragons or the white walkers to appear. But this is Georgia, a place that often seems unacquainted with irony or parody. Whilst the monument gives the outsider an uneasy feeling that Tsereteli was using Christian imagery to mould a personal view of a glorious Georgian past; very much a visual statement in the mode of Blake’s Jerusalem that Christ is synonymous with the destiny of the nation of Georgia (in the way that ‘Jerusalem was built amongst the dark Satanic mills’), there is now an added layer of meaning. Today the land the monument stands on is covered with signs stating clearly (in Georgian) ‘territory of the church’. To the north of the monument itself a new chapel has been constructed and the Georgian Church has appropriated this strange, late Communist monument to a quasi-religious national past for itself. Given the fact that Christ is subordinate to the heroes of Georgian identity this is, theologically speaking, rather strange. But then the pieces of the puzzle fall into place; in a Communist society uneducated in religion there would be no difficulty in raising men above the Son of God – the more relevant question is perhaps why Christ is included in this historical vision at all? More recently, since the fall of Communism, there has been a resurgence in religiosity and in the number expressing a religious vocation, but there has not been a similar expansion in theological education. Rather than looking to the ancient monastery of Iviron on Mount Athos founded by Georgian monks in the tenth century as their source of spiritual learning, the Georgian Orthodox Church has turned instead towards Moscow and follows a hierarchy as debilitated as the rest of the post-communist world by the Soviet prohibition of theological study. The Chronicle of Georgia can best be understood as a result of this theological weakness; a strange hybrid imagery where a localised form of Christianity becomes inextricably entwined with fierce nationalism – it is a vision which is strangely powerful and very, very unsettling. Jokes about Mordor or the land beyond the Wall don’t seem quite so funny when you are actually there and that might be why so few people visit the monument. Certainly the tide of Nationalism (with a capital ‘N’) sweeping the world at the moment feels very dangerous when in a place where Christ appears subordinate to the desires of his earthly servants. 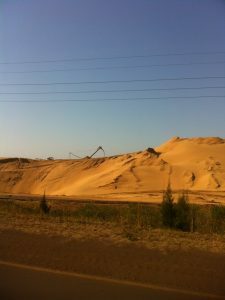 It cannot be assumed that countries with large mineral deposits should consider themselves blessed. The phrase ‘resource curse’ is familiar in debates about how natural resources like metals, minerals and oil are sourced by relatively developed countries in ways that leave a trail of devastation in their wake. But it is not enough to scapegoat the mining industry. Most, if not all, citizens of relatively developed countries benefit from the products of mining. Churches, pension funds, and many other investment bodies, also have money in mining and are thereby implicated in the actions of the companies in which they are invested. Mining companies vary considerably in policy and practice with respect to environmental protections, wage levels and employment practices, the payment of taxes and other revenues, relationships with local communities, and more. Mine-dredging of sand dunes at Richards Bay in KwaZulu-Natal Province for ilmenite, rutile and zircon. 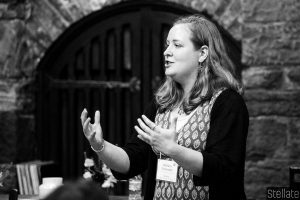 Esther Reed has been involved with the Mining and Faith Reflections Initiative since 2014 as member companies and churches aim inter alia to enable and support a dialogue in ways that encourage openness, honesty and the sharing of different perspectives on mining. One current topic of conversation is the possibility of chaplaincies at mine sites amongst some of the participating companies. Last term I was fortunate enough to assist and attend a conference organised by our own David Tollerton. Spread across two days, the ‘Engaging with the Holocaust in Secondary RE’ workshops inspired a great deal of healthy discussion and a fascinating insight into the current specifications used by major exam boards. 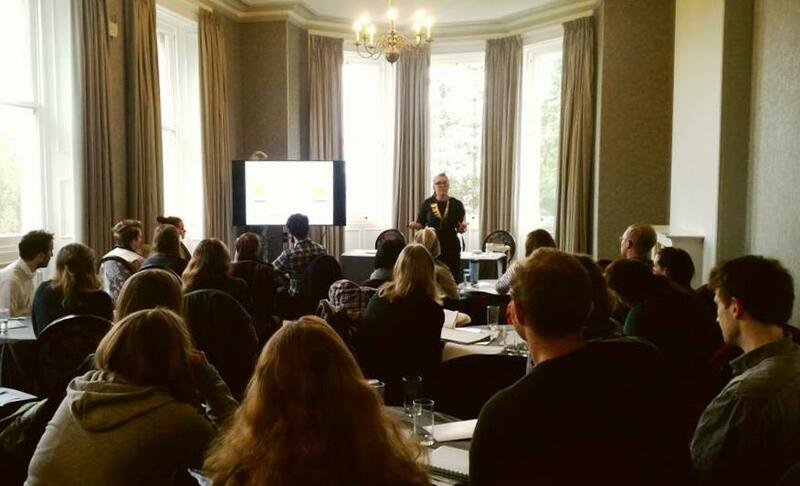 The first day’s workshop included presentations from Sarah Hall (University of Birmingham), Alasdair Richardson (University of Winchester), Alana Vincent (University of Chester) and David Tollerton. Sarah gave us an insight to a new exam board Judaism specification and how Holocaust studies has been incorporated into it. What was particularly interesting in this discussion was questioning how the major exam boards are expecting teachers to gather the necessary material and deliver this in a relatively short space of time. With the Holocaust being such a complex part of modern history to discuss, finding the balance of where to place Holocaust education in schools proves to be difficult. One aspect of this which was discussed at length was the argument of whether the Holocaust should be taught in history lessons as a study of past events or placed in RE as constructive activism. Nevertheless, it is a balance that must be reached, as Alana raised the point that a lot of undergraduates are undertaking their Theology course with a very narrow and limited understanding of both the Holocaust and wider Jewish experience. The morning training event the next day welcomed current and aspiring Religious Studies PGCE students along with a selection of current RE teachers from the South West area. Jenny Carson, Education Officer at the Holocaust Education Trust (HET) began the morning’s presentations by discussing the work of the HET and how teachers can access the resources available. Jenny emphasised the importance of thinking about pre-war Jewish life and how that resulted in quite varied experiences of Nazi persecution. With this in mind, it is crucial that teachers represent the Holocaust in the classroom in a way that ensures students are not coming out of the classroom thinking that the Holocaust is centred around Auschwitz. We then heard from Sarah, who was interested in discussing how visual art can be used as a refreshing stimulus in Holocaust education and how this relates to current educational policy and practice. Students will of course have different ways of learning, and engaging with visual art which is accessible to all, regardless of academic ability, can be helpful in encouraging creativity of thought and emotional learning. Sarah used the praxis of SMSC which focuses on incorporating spiritual, moral, social and cultural modes of learning. All schools in England must show how well their pupils develop in SMSC and visual art can provide a useful way of addressing religious plurality when teaching the Holocaust. Lastly, Alasdair addressed the extent to which teachers ought to ‘sanitise’ the events of the Holocaust in the RE classroom. With this he suggested that we need to put more of a focus on how students are learning rather than the outcome, and allow them the space to think in a critical and analytical way. In whichever subject the Holocaust is being taught there needs to be a certain level of impact and recognition of testimony’s importance, but without needlessly sharing gratuitous images and stories. Alasdair raised the point that when we commodify knowledge we leave no room for human connection. In the classroom, emotional engagement with a topic such as this is inevitable, with some students having a more vivid emotional response than others. An important message that the aspiring and current teachers received from Alasdair’s discussion was that to be a reflective practitioner is to understand that the pedagogy of a student’s learning goes beyond a surface level of what they know, but looks at how they affectively learn. Further to this comes a consideration of the prior experiences of students and asking what potential prejudices and connections each student is bringing to the topic. What stood out for me from attending this conference was that teachers are powerful people who have the ability to really shape a student’s outlook. It is one thing to have all the right resources, which of course is of huge importance with this topic and something which I hope will be made more readily available in the near future. It is another thing, however, to act with honesty and integrity while having the student’s best interests at heart. From the healthy and honest discussions had by those in attendance I feel very hopeful that Holocaust studies will continue to an important part of the syllabus and will become more freely interdisciplinary.